In our neighborhood, all the little ones assemble at a prescribed time and go door-to-door as one group. This works out perfectly as our doorbell only rings once, which means I only have to tackle the dog once. So, we grab the bowl that contains the candy that we’ve identified as “not good” and pass it out to the eager trick-or-treaters. (Oh, c’mon…you know you keep the good stuff for yourself.) And that’s that. Halloween is over quickly and fairly painlessly, except for the many pounds of leftover candy. Yes, we purchase Costco-sized bags (plural) of candy knowing that we will have less than ten trick-or-treaters. We’ve been eating Halloween candy happily since September and we’ll probably be eating it through Christmas. And I’m fine with that. The alternative to this is to not buy any candy so that we don’t eat any (which doesn’t sound as tasty). That’s what my parents do. Then they hide in the back room and don’t answer the door to the trick-or-treaters. I kind of wanted to do that just to avoid the trick-or-treaters, but then who would I pawn the Dots off on? So…when faced with a mountain of leftover miniature candy bars, what should one do? Make a Butterfinger cheesecake, of course! Place graham crackers in a food processor and run until crackers are a fine crumb. In a bowl, combine cracker crumbs, sugar, cocoa powder and butter. Press into a 9” springform pan. Bake for 9-10 minutes. Remove and let cool while you prepare the filling. Place Butterfingers in the food processor and pulse until all the candy bars are broken into very small pieces. Reserve a heaping 1/4 cup for topping. With an electric mixer, combine cream cheese, peanut butter and sugar. Mix in eggs, one at a time, until completely incorporated. Last, add in Butterfinger crumbs and mix until just combined. Pour filling on top of crust and spread out evenly. Bake for 40-45 minutes until center is just set. When cheesecake is done, let cool on a wire rack for about an hour, then transfer to the refrigerator. When cheesecake is cool to the touch, run a knife around the edge and remove springform band. Place cheesecake on a wire rack on top of a baking sheet. Prepare the topping by combining chocolate and cream in a small saucepan over low heat. Whisk until completely smooth. Immediately pour chocolate mixture over cheesecake, spreading it over the top and pushing over the edge to coat sides. (You may have a little left over, depending on how thick you want the chocolate on top of the cheesecake.) Sprinkle the remaining Butterfinger crumbs over the top of the chocolate. Refrigerate until cheesecake is completely cool, at least 3 hours. I was incredibly worried that an entire bag of perfectly good Butterfingers would be wasted if this recipe didn’t work out, but my worry was for naught. 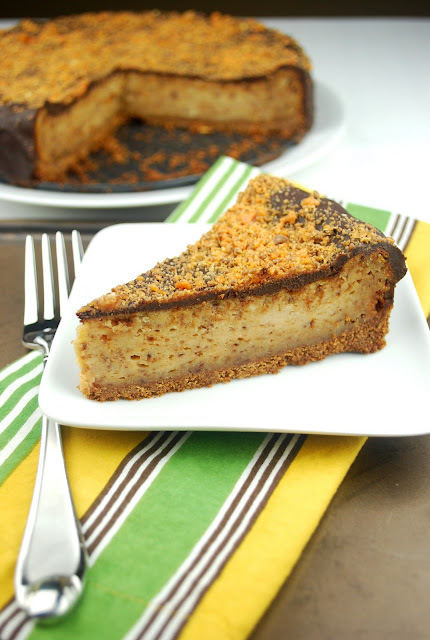 This is one rich, decadent, Butterfinger-y cheesecake. Even though I was stuffed from dinner, I managed to scarf down my own slice and finish off Andy’s. Because there’s always room for dessert, especially when it’s made with Butterfingers. I love Butterfingers and I love cheesecake. What a winning combo! Divine! Lovely combination and looks absolutely delish! hahahahhaa Dots! So funny!!! Love this recipe! Why does everyone always diss the Dots? I love them and will take your share! Of course, I also love cheesecake....Wow, that looks amazing. WE have copious amounts of candy left too, but that's because I sent Hubby out to get 'a' bag and he came back with several. I think I'll use your idea and make dessert happen. Oh lord! I'm loving all the post-Halloween candy recipes, and I have the biggest weakness for cheesecake. Looks to die for! WOW-o-WOW!! My kind of cheesecake! I feel weak at the knees gazing at your photos. i don't mind candy leftovers if I had this cheesecake to look forward to. Because of an early storm and power outages, Halloween was postponed until this Saturday so we still have plenty of candy around our house! And when I was thinking a cheesecake can't get any better! This looks insanely good! My husband has a stash of Butterfingers where he keeps his phone and wallet! lol! They are awesome!!! This cake is just too dangerous for this house...far too dangerous! Amazing! This looks delicious! I love butterfingers and cheesecake. My roommate and I did the same thing, we bought candy even though we live in an apartment complex where people don't trick or treat! oh my that looks heavenly! Thanks for the great idea on ways to use the leftover halloween candy! Can't wait to try this recipe! Thanks for sharing! I really appreciate your Halloween honesty - last year my dad and I were too lazy to go out and buy candy, so we just put an empty bucket outside the door, letting poor trick-or-treaters think that all the candy had been taken already. I mean, maybe not my proudest moment but what are you gonna do. This looks amazing but oh man I would be in danger if it were around me! This is blows perfection out of the water! i envy even that first bite you took....! Two of my favorite treats in one yummy dish! I'm pinning this...hubby would LOVE IT! We never get trick or treaters. I try not to buy candy cause I know we will just eat it all ourselves. I really want to eat the candy but I know once I start I won't stop. This year I actually went to CVS Halloween night at 6pm and stared at all of the options. I didn't come home with any but just looking helped. Butterfingers! And on a cheesecake, fantastic! Our house doesn't see too many kids either, so we have a ton of leftover candy. Your cheesecake looks awesome! Wow! it looks absolutely delicious!! Wow this looks awesome! 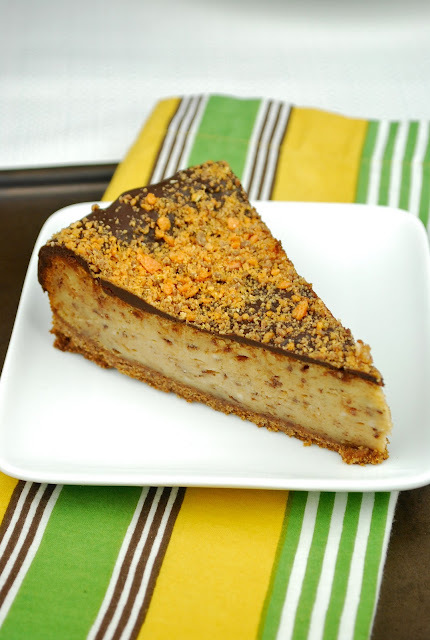 Butterfinger is my hubby's favorite candy bar so I def will have to make this for him. Thanks! That's a whole lot of cream cheese, this is great! I love cream cheese, not a fan of butterfinger though, so I guess instead of eating them all up and torture myself, I might as well mix it with something I really like. In this case, cream cheese! This is pretty creative. I am kinda looking forward to next year's Halloween and I'd specifically get Butterfinger ...LOL! Thanks! We used to be swarmed by tricker treaters but they have dropped off...and I'm still buying the same amount of candy...for the same guilty reasons :) Those frozen kit kats did hit the spot this week. Your cheesecake looks divine and you have inspired me to do something decadent with the leftover snickers. Thanks for sharing! What a decadent-looking, gorgeous, delicious cheesecake. I'm not crazy about cheesecake, but I would totally devour this! Your photos intensify my craving for this cheesecake. I'm the same as you guys with the candy. A candyaholic! If I ever had leftover butterfingers, this is what I would want to do with them. This is a gorgeous, genius-looking cake. And the pictures are so amazing! How much heavy cream? I think you missed a word in the directions for the chocolate topping. @Ann - Oops...you're right. I left out a word. It should be 1/2 cup plus 2 tablespoons cream. Thanks for catching that! Thank you so much Karen! I can't wait to try this recipe out! Hi, Karen. This recipe is amazing! I made it for Thanksgiving, which also happened to be my husband's birthday. It was such a hit I am going to make it for Christmas too! @Ann - I'm so glad you liked it! It's always nice to hear when someone tries a recipe, especially if it gets great reviews! Hope you have a wonderful Christmas! Living in the U.K I'm not entirely sure what butter fingers are but this cheese cake looks really good and I just love Chocolate.